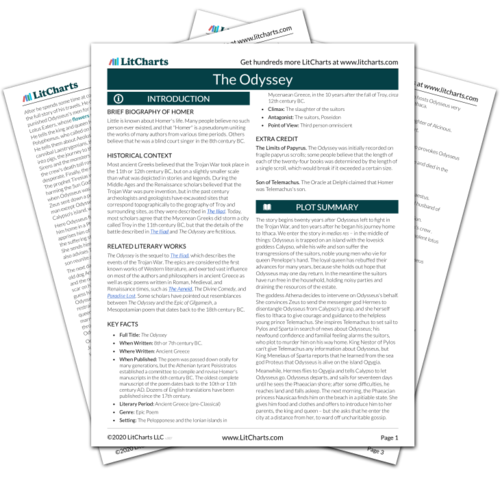 Instant downloads of all 942 LitChart PDFs (including The Odyssey). 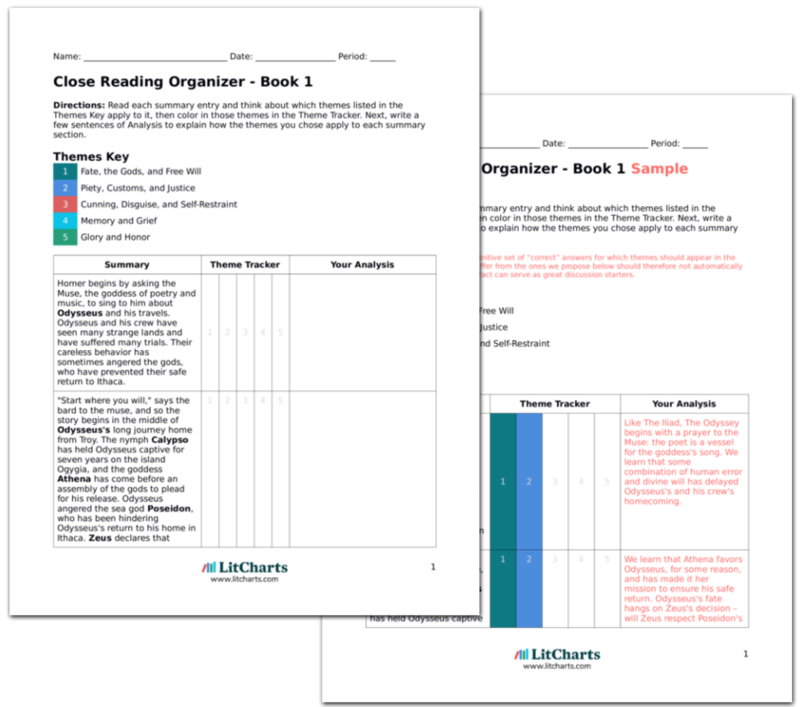 LitCharts assigns a color and icon to each theme in The Odyssey, which you can use to track the themes throughout the work. The suitors' ghosts fly crying to the underworld. As the ghosts arrive, Achilles, Agamemnon, and Ajax discuss their own deaths. Agamemnon envies Achilles and Ajax their deaths in battle. Agamemnon recognizes Amphimedon, one of the suitor's ghosts, and asks him why so many noble young men have died all at once. Amphimedon describes the suitors' courtship, Penelope's loyalty, and Odysseus's revenge. Agamemnon is glad that Odysseus's wife was more faithful than his own, and says that gods and men will forever praise her good sense and self-restraint. Although for most of the book it seems that Penelope has to wait passively at home while Odysseus commands armies and battles monsters, by the end of the book their roles seem to converge: both are patient, cunning, and loyal, and both have become famous for their intelligence and honor. Though Penelope, as a woman, cannot gain glory in battle or athletics, she can equal a man in cunning and self-restraint. Meanwhile, Odysseus and his three companions come to Laertes' farm. Odysseus finds his father working in the vineyard and weeps to see his decrepitude. Despite his pity, he decides to test his father's loyalty. He tells Laertes that he is a traveller from another land, and that he once hosted Odysseus. But Laertes cries to hear Odysseus's name, and Odysseus breaks down and reveals his identity. Laertes asks for proof, so Odysseus shows him the scar and describes the fruit trees Laertes gave him when he was a boy. They embrace joyfully. Odysseus has defeated the suitors and regained control of his realm, so he has nothing to fear from his father. The test of loyalty he plans is, once again, the deceit that brings one to sincerity: it allows for complete trust. But Laertes' tears are proof enough. It seems that grief, in this world, cannot be faked, so tears of grief dissolve any disguise. As the men eat lunch, Dolius and his sons come in after working in the fields and happily greet the long-absent king. The goddess Rumor flies around the town and spreads the news of the suitors' deaths. Soon, the dead men's relatives come to gather the corpses. Antinous's father Eupithes calls out for revenge, but the herald Medon warns the crowd that the gods are on Odysseus's side. Some back down in fear, but others get ready for battle. Like the suitors, some of the relatives are foolish enough to try to fight the gods. To be pious, one must understand the role that gods play in the lives of men: piety requires a certain degree of cleverness and self-control. Athena appears at Zeus's side and asks him if he wants the fighting to continue; he tells her that the townsmen should forget their grievances and live in peace. Back at the farm, Odysseus and the other men get ready to face the army from town. Athena in the disguise of Mentor gives Laertes great strength and he kills Eupithes with a spear. Athena orders the townsmen to stop fighting, and they flee in terror; Odysseus obeys the decree as well. Ithaca is finally at peace. Notice the symmetry of Laertes, Odysseus's father, killing Eupithes, Antinous's father. The ending of the Odyssey might be the original deus ex machina, or "god from the machine": a literary device in which a complicated problem is suddenly resolved by an unexpected intervention. Uncharacteristically, Athena appears undisguised and gives direct orders. Perhaps the gods are too sly to adhere to patterns; perhaps the end of the story must be as jarring as the bard's sudden silence. 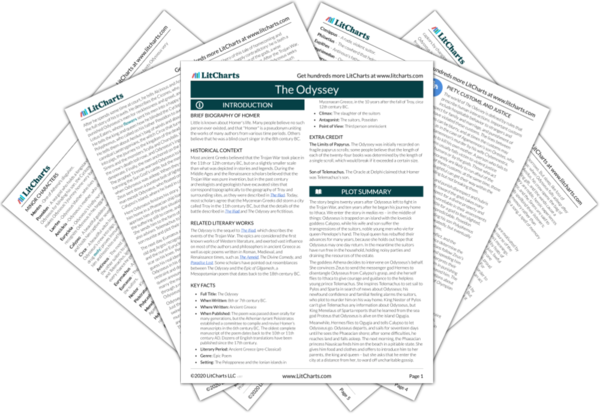 Get the entire The Odyssey LitChart as a printable PDF. Tsykynovska, Helen. "The Odyssey Book 24." LitCharts. LitCharts LLC, 15 Sep 2013. Web. 24 Jan 2019. Tsykynovska, Helen. "The Odyssey Book 24." LitCharts LLC, September 15, 2013. Retrieved January 24, 2019. https://www.litcharts.com/lit/the-odyssey/book-24.